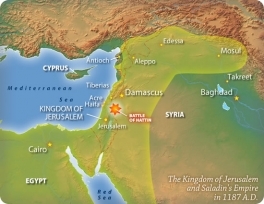 The Third Crusade (1188-1191) was the most bitterly fought of all the Crusades in Palestine. With the dissolution of the Fatimid Caliphate in Cairo and the consolidation of Salahuddin’s hold on Syria and Egypt, the balance of power in the eastern Mediterranean tilted in favor of the Muslims. 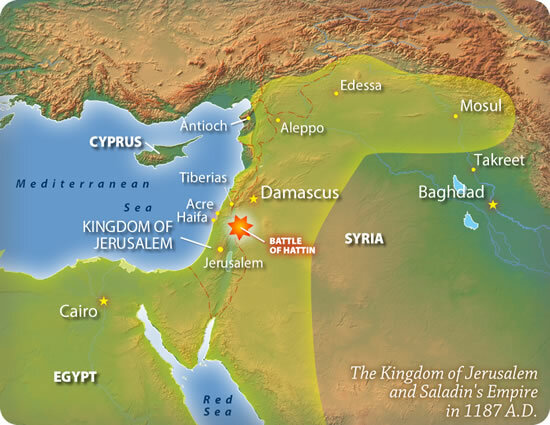 Arabia, Yemen as well as northern Iraq and eastern Anatolia were also added to Salahuddin’s domains. It was only a matter of time before the weight of this power was brought on the Crusaders. The cause for hostilities was provided by one of the Latin chiefs, Renaud de Chatellon. Renaud was the king of the coastal cities in Palestine and Lebanon. To quote the well-known historian Bahauddin: “This accursed Renaud was a great infidel and a very strong man. On one occasion, when there was a truce between the Muslims and the Franks, he treacherously attacked and carried off a caravan from Egypt that passed through his territory. He seized these people, put them to torture, threw them into pits and imprisoned some in dungeons. When the prisoners objected and pointed out that there was a truce between the two peoples, he remonstrated: “Ask your Muhammed to deliver you”. It was at this juncture that Richard made his historic proposals to bring peace to Jerusalem. According to its terms, Richard’s sister would marry Salahuddin’s brother Saifuddin. The Crusaders would give the coast as dowry to the bride. Salahuddin would give Jerusalem to his brother. The bride and groom would rule the kingdom, with Jerusalem as its capital, uniting the two faiths in a family bond. But the priests and many among the Franks were opposed. Threats were made for the ex-communication of King Richard. Tired and disgusted with the narrow-mindedness of his comrades, Richard longed to return home. Finally, a peace treaty was concluded between Richard and Salahuddin. Under its terms, Jerusalem would remain under the Sultan but would be open to pilgrims of all faiths. Freedom of worship would be guaranteed. The Franks would retain possession of a strip of land along the coast extending from Jaffa to Tyre but the bulk of Syria and Palestine would remain in Muslim hands.